This coffee dripper only requires coarse to medium-coarse coffee grounds and hot water to use. No paper filters, electricity, complicated parts or contraptions needed. 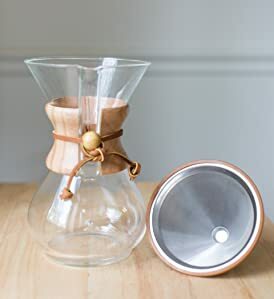 Use the stainless steel cone dripper to prepare just a single cup at a time or a small pot for 2-3 people to your exact taste and strength preferences. The non-slip silicone ring grips the rim of your carafe (without scratching) for easy and safe brewing. The color even matches the wood of your Chemex! 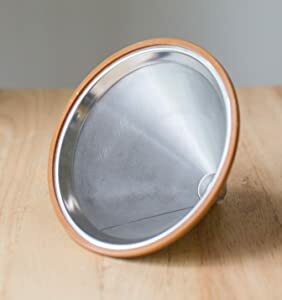 Unlike paper filters, the stainless steel filter allows oils and nutrients to pass through to your cup instead of getting trapped or absorbed, ensuring a better tasting cup of coffee. Unlike other coffee drippers, the Willow & Everett filter features high quality 18/8 stainless steel with dual filtration. 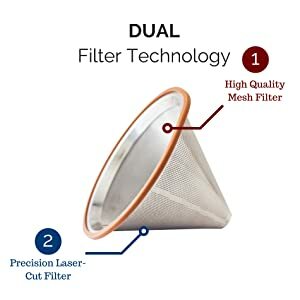 ​This means you get two layers of a fine high-quality mesh on the inside, and a laser-cut filter on the outside preventing any grounds from getting inside your coffee and ensuring the optimal length of brewing time. The Willow & Everett stainless steel coffee dripper was designed to complement the design of your glass coffee carafe not detract from it. The attractive mirror finish and stainless steel design fits most name-brand coffee carafes including Chemex and Hario and unlike paper filters, allows the natural flavorful oils from your coffee grounds to pass through to your cup instead of getting stuck in the filter.